6.2 How can I synchronise or syndicate content? This page has been put together with the aim of guiding you through use of the calendar tool. The Calendar is very flexible so you can choose how to find, select and view events and then add them to your own calendars, print them off or view them on a mobile device. 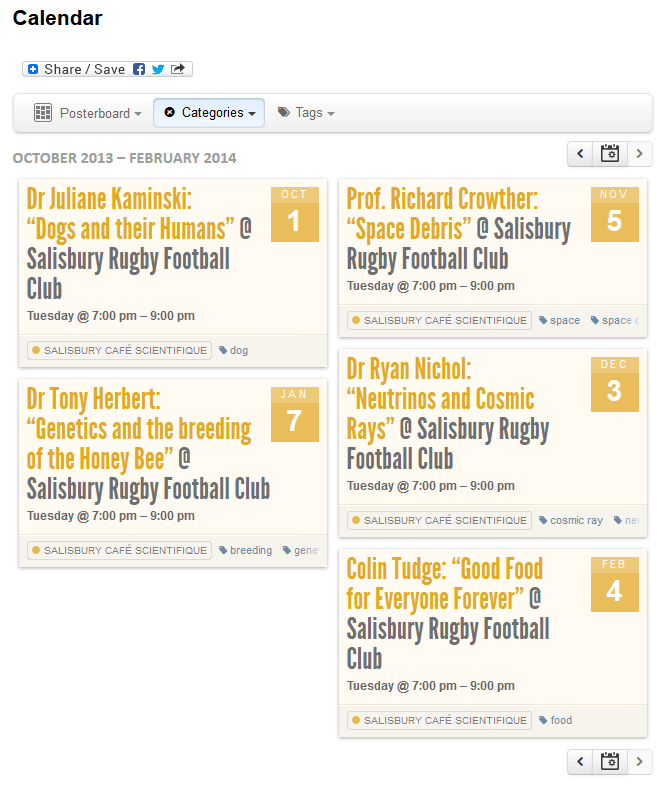 The calendar includes not only the Salisbury Cafe Scientifique events but a whole range of accessible events from other organisations including other local Cafe Scientifique branches, universities and science institutions. That means at any one time there may be hundreds of science events you may be interested in from a whole range of sources! The calendar has different Views which will be explained further. 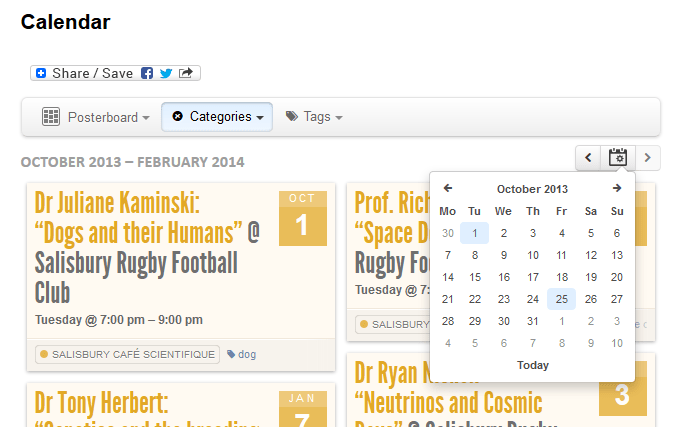 The calendar also uses Categories and Tags in the same way as the rest of the website. Tags are used to describe content and can be used to filter the events to ones of potential interest. Categories represent the sources of the events and can likewise be used to filter content. This page will explain how the different views and options work. 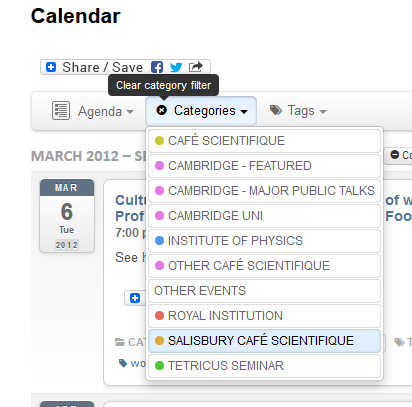 The calendar has a default view of Posterboard with a Category filter on to show only Salisbury Cafe Scientifique events. Filters can be applied using the controls above the view. Filters can be applied by Category and/or Tag. Hover over each control to see the lists as shown here. Please note some of the terms listed may now be different to those seen on the website. If a Category or Tag filter is currently applied, the tab will appear in bold with a small x which can be used to remove a filter. Hover over the x and a tooltip will be displayed indicting the button can be used to clear the current filter. To apply a filter, hover over the Categories or Tags control, move to the item in the list you want to filter by and select it. By repeating this you can add multiple cumulative filters. To remove a filter, select the item being used as a filter from the list as before; selecting an item a second time reverses it filter condition. 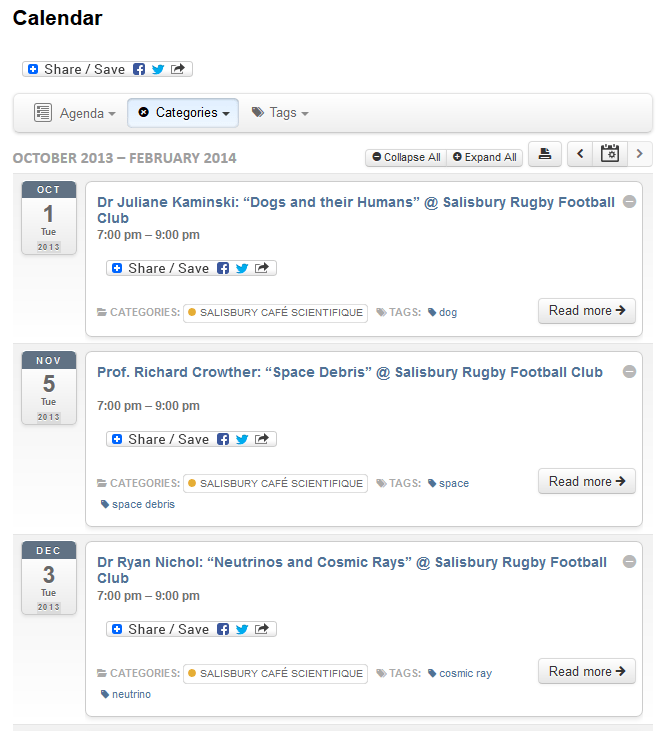 Categories are used to group events by source when they are added to the website. Each category represents an organisation or group of organisations which provide calendar information used on this website. Simply select or unselect a Category from the list to use it as a filter. Tags are used to describe content. They can be used to find all talks, past and future, on a particular topic or which share a keyword or theme. Some are broader than others (eg biology vs molecular genetics), some focus on an affiliation or funding body (eg a university or charity) whilst some focus on specific aspects of the talk such a technique (eg microscopy) or subject (eg moths). Simply select or unselect a Tag from the list to use it as a filter. There is also a date picker to allow you to select a specific date, month or year and filter accordingly. 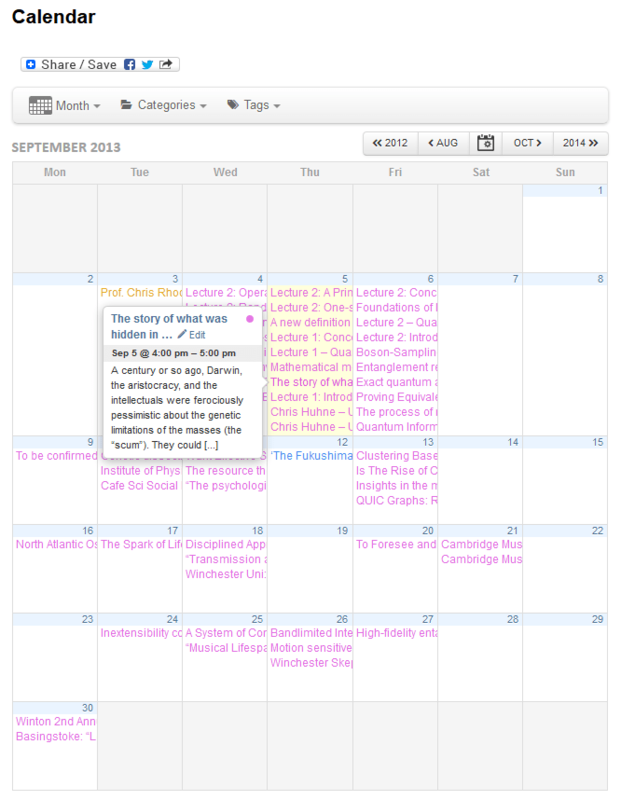 Views can be changed using the drop down list above the Calendar. Hover over it to see the list. Views available are Posterboard, Agenda and Month. This view is great for a quick view of upcoming events. 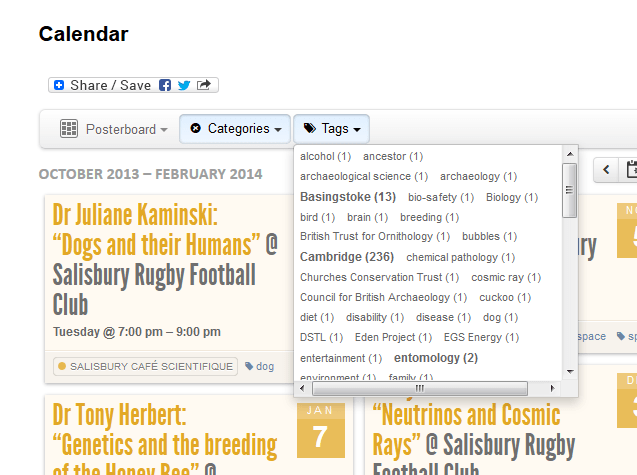 The view can be filtered by Tag or Category to show more or fewer events. The Month view allows you to see some or all of the events happening in any given month. 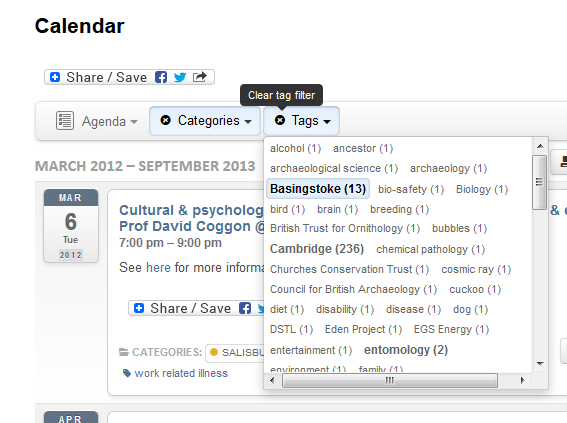 The view can be filtered by Tag or Category to show more or fewer events. 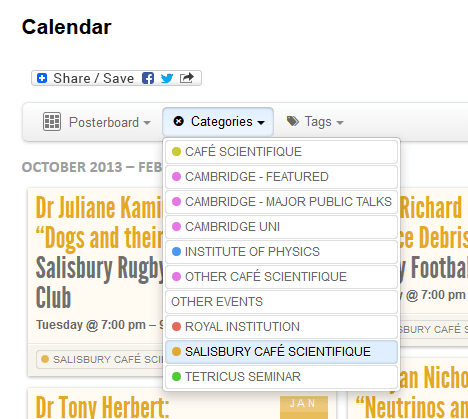 in the view shown here, many Categories are enabled and the more information tooltip is shown by hovering over an event. The Agenda view presents some or all of the events in a sequential list, ordered by date. This list is ideal for printing and indeed has a Print button to facilitate this. The plus/minus buttons in the top right can be used to expand/collapse a single item to read more/less information. Alternatively use the Expand All and Collapse All to expand/collapse all items in the list. Use the Print button (circled in red) to print a copy of the selected items. Clicking on any Event hyperlink from any filtered or unfiltered list or from a hovering information box will take you to the event full details page. These pages contain as much information as is provided by the source of the Calendar so we cannot be responsible for any errors or ommisions for external sources. For such external events, there is always a link back to the source website so you can contact the organisation responsible directly as needed. Details typically include time, date and location but may also include fuller descriptions, maps and/or directions and other useful information. 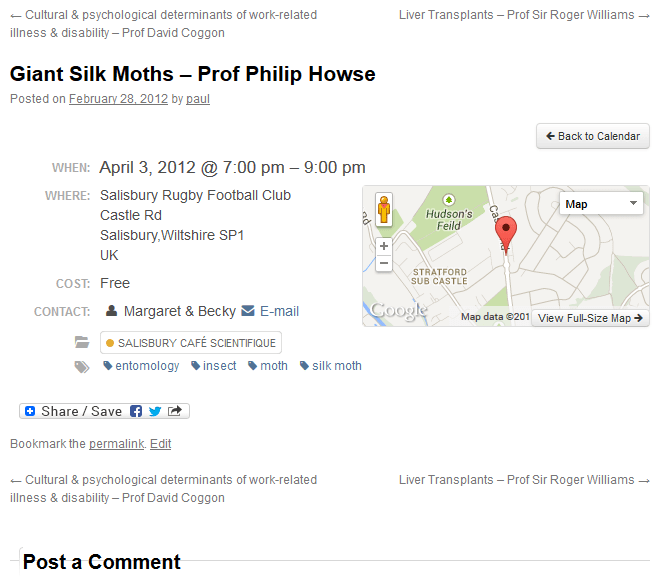 For Salisbury Cafe Scientifique events, there will be a link for more information over on the Blog, where there is typically more background on the subject of the talk, the talk itself and/or the speaker. Simply choose Agenda view, then optionally apply or remove any Filters you wish and use the Print button as shown above. Other views can also be printed from most modern web browsers. The Calendar can also do some clever things if you would like it to. Events can be synchronised to your diary/calendar applications, your own website or even your mobile phone. 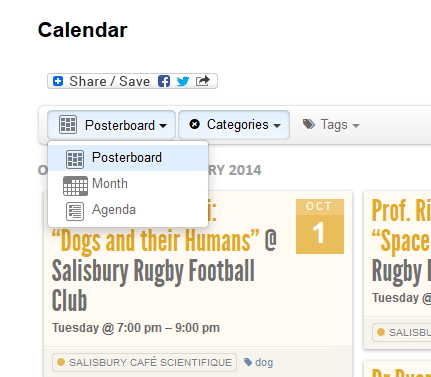 The system in use is the Time.ly calendar, implemented using the Plugin for WordPress. This is a great system and (importantly) free for non-profits to use. How can I synchronise or syndicate content? The Calendar uses ICalendar to provide feeds of events. Any application or website which uses this platform should be able to provide and/or accept calendar feeds from this website. Use the appropriate subscribe buttons below the Calendar and either click or copy the link location into your application. The button indicates if there is currently a filter applied. The subscription can be filtered by Tag or Category to include more or fewer events.